Most spills occur tipping a normal can to get the spout into the tank opening before the liquid comes out, or removing the spout from the target vessel before overflowing. The No-Spill spout is fully user controlled so you tip the can vertical, insert the spout into the vessel opening, then press the button to begin and control pouring. To stop pouring simply release the button. Practically eliminates spills and overflows. The only Spill-Proof spout with thumb button control that does not push down on your tank’s filler neck to pour. More control, fewer tip-overs of your small equipment. The fastest pouring Spill-Proof nozzle available. At up to 3 gal/min, compare to other brands at 1.5 to 2.0 gal/min. Meets California Air Resources Board requirements for sale or use in California. Autostop removable nozzle, single opening for filling & pouring, treated can body for low permeation. The most user friendly CARB compliant can available. Fills equipment without the need to press down on the tank opening. 6-inch Flex Spout Extension (sold separately) allows filling of on-road vehicles, boats and many other hard to reach tank openings. 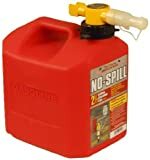 No-Spill Gasoline cans are tested and certified to ASTM F-85299 Standard Specification for Portable Gasoline Containers for Consumer Use and our Diesel & Kerosene cans are tested and certified to ASTM F-97602 Standard Specification for Portable Kerosene and Diesel Containers for Consumer Use.